Get the best of both land and sky on this morning zipline and horseback-riding adventure from Puerto Plata. 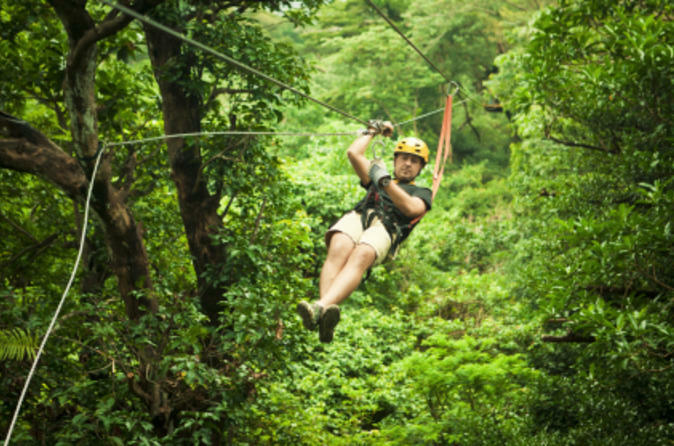 Soar above the treetops as you make your way from platform to platform on a thrilling 2-mile (3 km) zipline course. Then take off on a guided jungle horseback ride through the thick tropical forests of Dominican Republic. This tour highlights some of the region’s best and most beautiful landscapes and is not to be missed! No prior riding or ziplining experience necessary! Experience the thrill of exploring Dominican Republic on land and in the sky during this Zipline and Horseback Riding Combination Tour in Puerto Plata. Meet your friendly guide and professional driver at your hotel and travel in comfort to where your zipline and horseback-riding tour kicks off. Sit back and relax while you get a safety overview and then prepare for the rush of a lifetime! Soar across the lush jungles and over towering tree tops as you channel your inner Tarzan and make your way across 10 lines. After exploring the jungle from above, make your way on foot, during a memorable nature walk with your guide. Learn about the plants and animals that comprise the unique ecosystem here as you head to the horse stables. No riding experience is necessary, and a safety and equipment briefing ensures everyone is ready to ride. You’ll follow your guide through the beautiful jungle on a half-hour horseback ride before returning to the ranch for beverages. Your tour ends with return transpiration to your Puerto Plata hotel.